Strategic Planning: What is a strategy? The setting of goals and objectives is not, of itself, sufficient to ensure that the organisation will progress towards its goals. This is achieved by adopting and implementing strategies over a period of time. Strategies are what must be done by the personnel of the organisation in order to achieve the needed progress. If the objective is to "increase membership" then the strategy is what will be done to achieve this membership increase. The pursuit of each objective will require at least one strategy but often the implementation of several strategies. A strategy is a plan of action to achieve an objective that is usually major, comprehensive and long-term (Higgins and Vincze, 1989). Strategies are where organisations put their efforts in order to achieve the desired changes that will bring about the achievement of the organisation's goals. Put simply, a strategy is something that must be done to achieve the objective (the measure of change). The pursuit of each objective will require at least one strategy but often the implementation of several strategies in tandem. Conduct social events appealing to the members aged 18 - 25. The range of possible strategies is infinite and the above examples serve only to illustrate how strategies differ in wording from goals and objectives. Strategies are a statement of what must be done. Developing strategies should follow as a logical consequence of the determination of goals and objectives. It is necessary to indetify goals first and then work backwards to determine what strategies could be employed. One of the main problems is, however, that there is an almost infinite number of things to do. The task is to decide upon the best strategies, the ones that are most efficient and the ones that will work. It is a tough task formulating strategies and really there is no substitute for consultation on a wide basis. It is important to test proposed strategies with many people to see what they think, and whether they will support the strategy. On the other hand if you find difficulty with developing strategies for certain objectives try to consider what can be done to improve the organisations services. The above objective ("To reduce member loss between ages of 18 and 25 by 20% by 2014") could also be satisfied by the strategy "Inaugurate a social club with regular social activities". Increasing the quality of a particular service provided to stakeholders will always be a good strategy if it can be afforded. 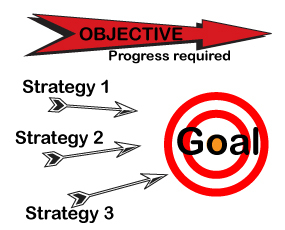 Determining goals and objectives may be a difficult task but identifying strategies is harder. It is often the case that those charged with the task of strategic planning are not greatly familiar with the organisation's history or the process of strategic planning. In such situations there is an ever-present danger of "re-inventing the wheel" i.e. strategies may be re-used even though they proved unsuccessful previously. There is also a possibility that strategies may be identified that are beyond the capability of the organisation. For example, the organisation may lack the human resources or financial resources to implement certain strategies. It is important to consider whether strategies a realistic. Sport and recreation organisations are very often managed mostly by volunteers (unpaid workers). If the strategic plan is too complex, that is contains too many strategies, it may be difficult to achieve success. Planners may need to consider whether it is better to develop a small number of strategies and concentrate efforts, or whether it is a better ploy to scatter resources over a greater number.